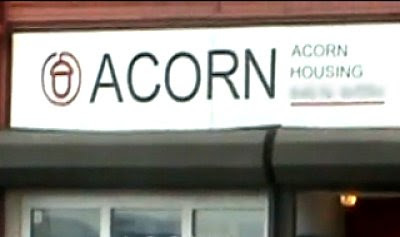 Hidden camera ACORN sting operation, segment #408. How come? What kinda business is this? We're gonna ship up a "Tijuana Donkey Show" and need a place with a garage. Oh yeah, no problem. We could get you a place with a two-car garage for the donkey. Cool. Plus, we're going to need to store some guns. About three hundred full-auto AK-47s. What do you recommend? Happened last month. We rent you some storage facilities with taxpayer money... totally free to you! Wow, excellent! One last request. It's kinda... errr, sensitive. Oh, this is crazy... what a coincidence!! We set someone else up last month with a similar operation... an exotic panda restaurateur specializing in high-end, necrophiliac clientele. Very successful operation. Very lucrative. Oh, I'm so relieved. I was worried that was... too... out there, you know? I understand. We deal with these special requests all the time. Now -- is it okay that we're Republicans? What the -- ? Get the hell out of here! Get out of here now, before I call the cops!! What kind of operation do you think we're running here? This is ACORN! We've got standards around here! Now, get the hell out of here! Great job...I sent a link to HotAir..Hopefully they send you some link-love.